A mild-mannered bachelor tried to kiss a zombie on Saturday evening on the Lower East Side. He succumbed to her bite soon after. A group of medical students made earnest attempts to reanimate a corpse. Religious objects were desecrated. There was blood. A scene from Matthew Welch’s “ReAnimator Requiem.” Richard Termine for The New York Times. 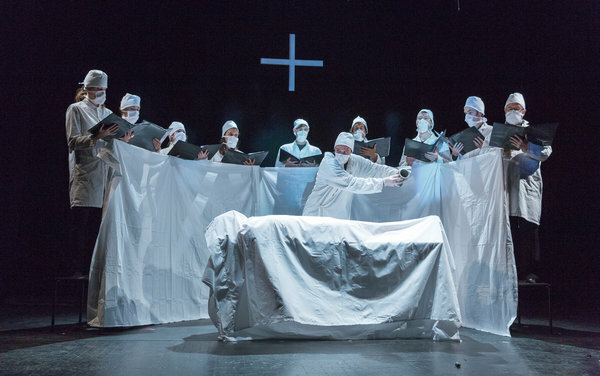 Halloween reveling continued into the weekend at the Abrons Arts Center, where Experiments in Opera, a composer-driven initiative, opened its season with “Chorus of All Souls,” a program of short choral operas bathed in a ghoulish light. In partnership with Vision Into Art, it brought to the stage two one-act operas, Jason Cady’s “Nostalgia Kills You” and Matthew Welch’s “ReAnimator Requiem,” as well as John Zorn’s a cappella mystery play, “The Holy Visions,” based on the writings of the 12th-century mystic Hildegard von Bingen with evocative video projections by S. Katy Tucker.